I had already traced the fusible patterns for this block that I was originally planning to use in Blog Quilt #1. 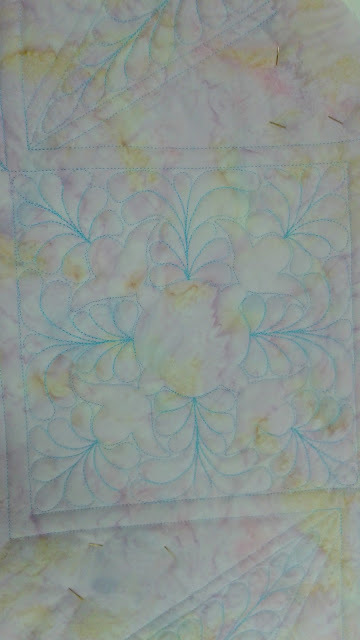 It didn't work out in that quilt, but since I already had the fusible traced I figured I should make the blocks. Just Right! It allows the fabric in the "x" to shine. Now to decide on the curves. I like this fabric. Blue dots? They don't really do much. Lavender?! 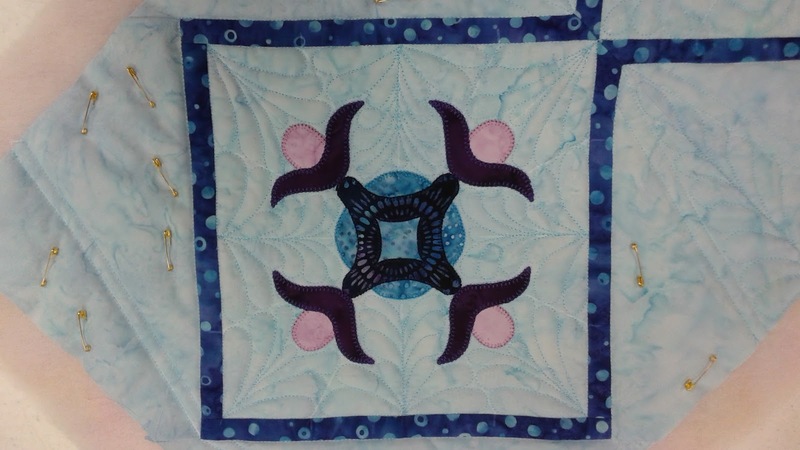 It brings out the lavender in the "x" fabric and makes the block sparkle. I love it! Now to blanket-stitch it! I've decided to call this project Unexpected Tablerunner. If you look carefully, you can see the difference in scales. 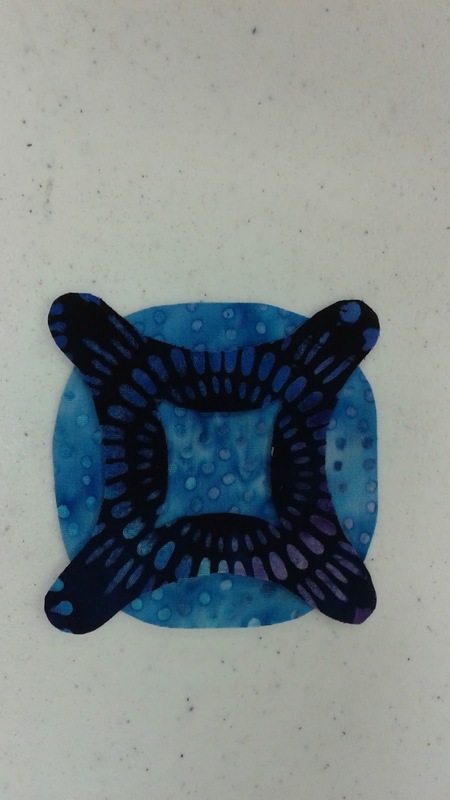 The dark blue in the center is done in a 1.4 mm wide and 1.4 mm long stitch. 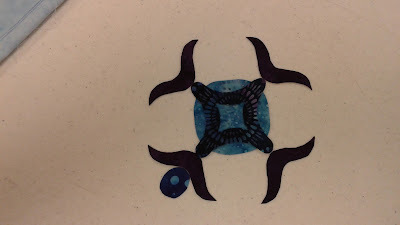 The light blue behind the dark blue is 2,0 mm x 2.0 mm blanket-stitch, my usual size. The pale lavender dots are 1.8 mm by 1.8 mm blanket-stitch. 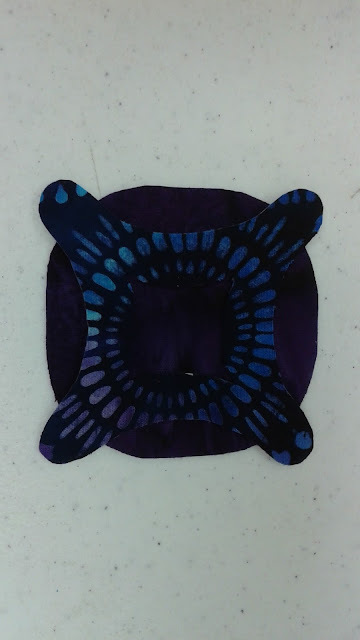 I was a little nervous to do the dark purple curves because I decided to stitch them in a 2.2 mm by 2.2 mm blanket stitch. It was really fast to stitch because the stitches were so long, however it did come with it's challenges. Going 2.2 mm into the fabric meant that when I got to the points the stitch would've gone beyond the fabric and over onto the background. I angled the stitches in a little more to make sure they stayed on the purple fabric and it worked like a charm, but I had to remember to do that at each point. Overall, I am very happy with the different sizes of stitch. I think it adds a little more interest to the block and I want to play more with vary sizes of stitch. 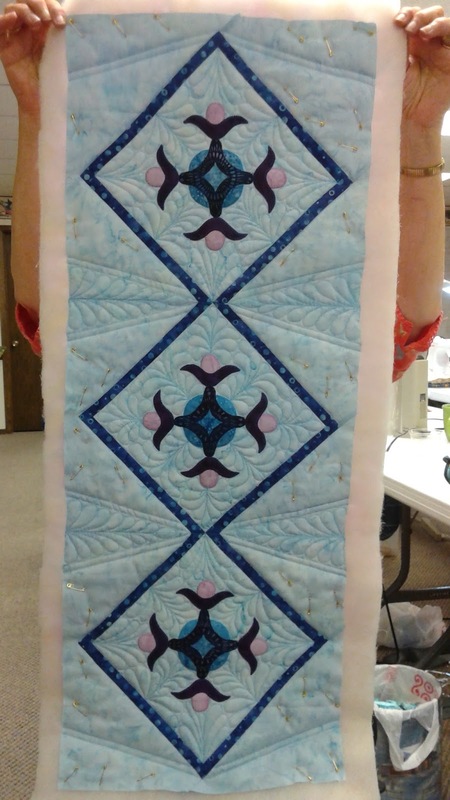 I was so excited to quilt my table runner. I quilt a lot of show quilts and they take me a long time. With this quilt I wanted to try something modern and fun and I wanted to use feathers as they are my favorite! 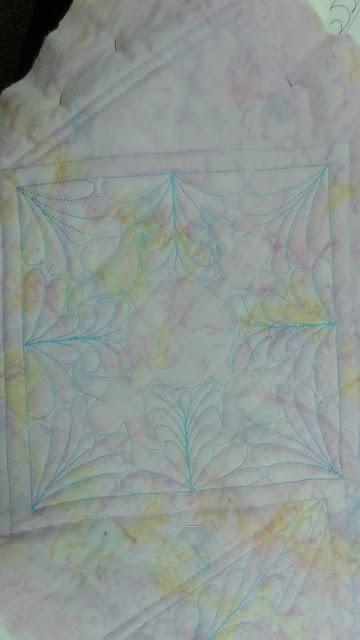 I also wanted to incorporate more straight lines to separate large open areas as that seems to be a recent trend in free motion quilting. 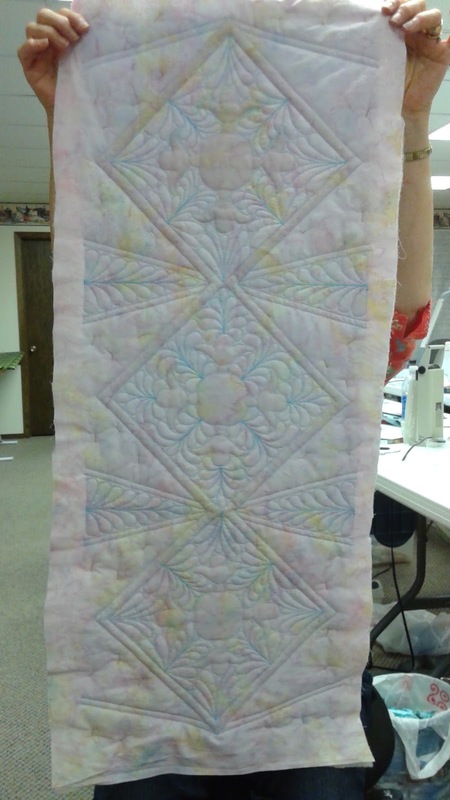 I quilted some feathers coming in from the edge of the block. 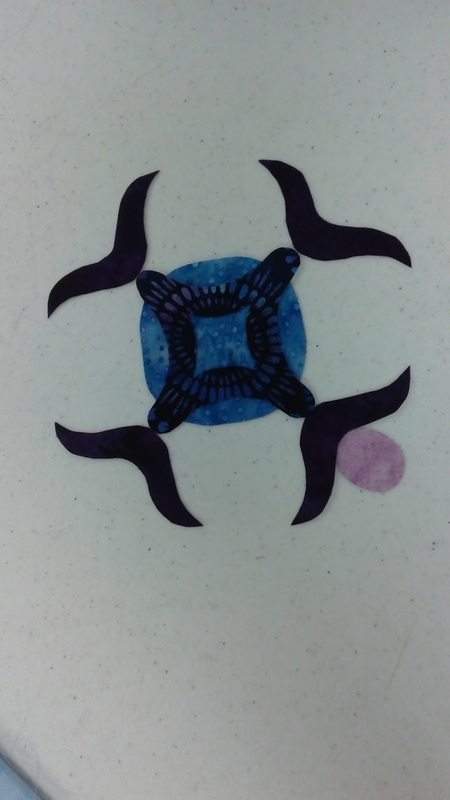 I did this in the two outer blocks on the left and right sides. To add more interest I quilted feathers coming from the inside of the block to the outside. 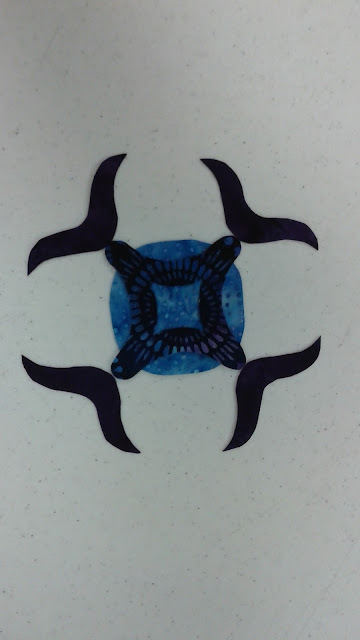 I did this in the center block. Here is the tablerunner once all the feathers have been completed. As you can see, I divided the larger triangles into three smaller triangles to add interest to the quilt. I drew the lines with the help of the 30 degree mark on my ruler and then added a 1/4 inch outline to the outside of those lines. Inside them I quilted a feather. 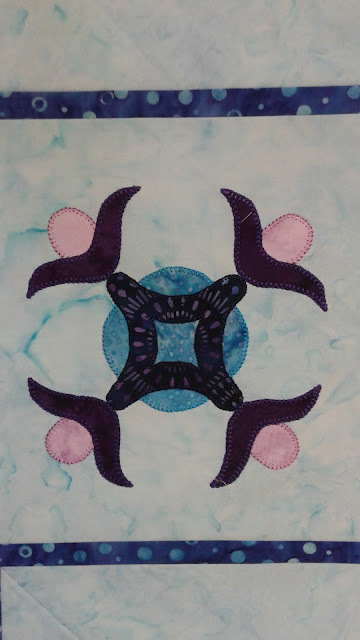 Since I also quilted the inside of the blocks with a feather, I decided that the remaining unquilted areas needed something completely different. Here's the back so far. I decided not to try to quilt feathers in the very outside corners. Instead, I decided to trim the outside of the tablerunner to match that angle. It's done! I couldn't be happier with how it turned out. I especially like the ends that are pointed like an arrow. Thank you to my friend Helen for explaining how to fold the binding properly! I also like that I used the center circle fabric for the binding. It's a nice way to tie it all together. 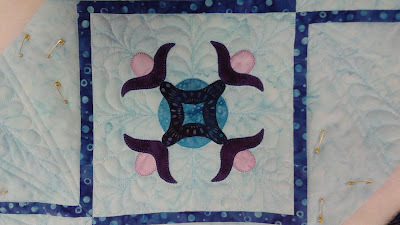 It had been awhile since I'd quilted baptist fans, but I'm really happy with how they turned out. you can really see the thread because I used a slightly darker thread. The back looks great too. I like how the light blue thread shows up on the lavender fabric. I'd put it on my Thanksgiving table, but I have two young boys who I know will spill on it! Perhaps on my dresser.